The Hotel Milano Castello is in a strategic position to reach the Teatro alla Scala, just a 5-minute walk away. Idomeneo will be on stage on 16, 19, 22, 25, 29 May 2019 and 1, 5, 7 June 2019. The work was commissioned to Mozart by the elector Carlo Teodoro di Baviera in 1780, to have it represented privately in the Residence in Munich, the court theater of Munich, in the carnival season of the following year. Author of the libretto was Giambattista Varesco, court chaplain of the Archbishop of Salzburg. The composition was laborious and involved numerous modifications due to the verbosity of the libretto, according to Mozart himself. 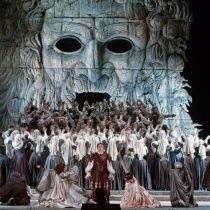 Diego Fasolis returns to La Scala with Idomeneo with an interpretative approach that offers the public a broad overview of the possible readings of one of the greatest geniuses in the history of humanity. On stage a new staging by Matthias Hartmann, while artists already applauded in recent Scaligera productions return: Julia Kleiter is Ilia, Bernard Richter sings Idomeneo and the part of Elettra is entrusted to Federica Lombardi.